As mentioned previously on this blog, one of the areas that has been mostly overlooked in the post-Haiyan relief effort is Danajon Bank in northern Bohol Province, Philippines. Last month the area was badly damaged by a 7.2 magnitude earthquake that destroyed over 2,000 houses and left many thousands of people homeless. Since then, this rare and threatened double-barrier reef and many of coastal and island communities that depend on it for food and livelihoods have been further affected by aftershocks as high as 5.1 on the Richter scale (over 3,000 so far) — as well as by the typhoon itself. This week, ZSL and Project Seahorse delivered emergency aid to 1,250 households in seven different towns and villages in the area. These are communities near and dear to our hearts, communities we have collaborated with on conservation programs for many years. Our local staff report that people are doing as well as can be expected. 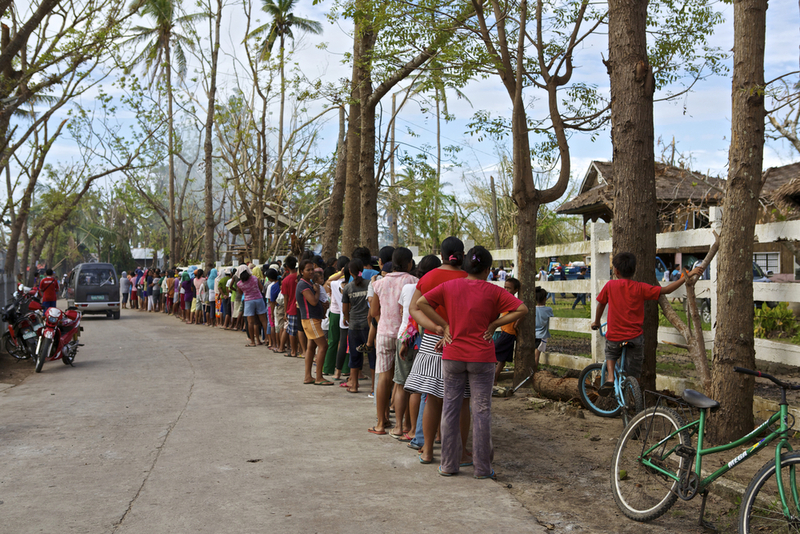 Thanks to the hard work of local People’s Organizations and other community-based groups, the emergency packs consisting of food, clean water, hygiene products, and essential medicines are quickly reaching the neediest people. …and I’m here to ask about seahorses. Now, as a quick personal back-story, growing up around fisheries I still remember hearing about this or that (usually foreign) conservationist and their quest to save something, usually shutting down a fishery in the process. So the irony was not lost on me as I moved down the beach with my bottled water (oh, how the tables turn) and, through my translator, Boiro, asked fishers about their catch. Did they see any seahorses, how many, etc.? Usually, the initial look of suspicion was replaced with one of honest surprise (and perhaps some derision) upon accepting that yes, this ‘Toubab’ is a student, and he actually just wants to know about seahorses. Seahorses, of all things! Seahorses are listed under Appendix II of CITES (Convention on the International Trade in Endangered Species), which means they can be legally caught in a country, but require a permit to export. Exports from West Africa to Asia (as traditional Chinese medicine) have been increasing quickly, but exactly where they’re being fished and how they compare with declared exports is unclear. My job is to continue research begun last year and estimate how many seahorses are being caught by fishers here, how they are being traded within the country, how they are getting out, and how the authorities are dealing with it, if at all. Three week’s research (so far) into the trade in Senegal and Gambia, here’s the lowdown. First of all, seahorses are not high on anyone’s radar. Fishers catch some by accident here and there; some traders might collect them and re-sell, and eventually larger handfuls of seahorses are accumulated on their way to Dakar. When asked how big a part of his business they are, the owner of a seafood processing plant and the largest single (legal) exporter of seahorses in Senegal laughed and said “0%”. After touring his plant, I believe him. In fact, many government officials and scientists, and even some fishers, were unaware of the seahorses trade in Senegal and Gambia. This is a classic example of the scaling-up phenomenon in fisheries. Even if individual fishers only occasionally catch a few seahorses, the sheer number of pirogues and industrial trawlers on the water means that an estimated 1.8 tonnes of seahorses (almost 300,000 individuals) are landed per year, just over six times the legally-exported amount. The rest of the seahorses are taken to Asia illegally, either by boat crews returning home or by clandestine exporters. This gap between perception and reality speaks to the much larger issue of global bycatch, which affects seahorses and many other marine species. What does this mean, specifically, for seahorses in West Africa? Well, we’re still working on that Our estimated seahorse landings represent less than one-thousandth of a percent of total Senegalese fishery landings. What we do know is that awareness is the necessary first step toward a sustainable seahorse trade in the region. After compiling results from our research, we brought together and shared them with key representatives from almost every stakeholder group you would want present, including CITES authorities, government officials, fish exporters, non-governmental organzations, academics, and policymakers. They now know what seahorses look like, how the males carry eggs and how to tell them apart from females, where and how they are caught, how they are being legally and illegally exported, and why this is something they should care about (trade sanctions if nothing else). More importantly, participants themselves were quick to spearhead discussion on the next steps to tackle this issue (and related ones such as shark-finning and customs practices), and have already started to move the wheels. On the biology/ecology side, we tripled the amount of seahorses previously sampled in this region and will now attempt to find more of them in the wild (tricky, but stay tuned). This will help provide much-needed local data for scientists and managers. Developing countries face many serious economic and societal problems, such as poverty, which would seem to transcend by far even the most legitimate conservation concerns. Ultimately, these issues belong on a continuum, and need to be addressed together, with effective, holistic policies — sustainable fisheries being a step in the right direction. My field work in West Africa has made me realize, that if we only focus on and wait to solve the large-scale issues, we might eventually find that all the smaller conservation battles were lost in the meantime. So when you are tasked with even a seemingly-inconsequential aspect of conservation in a country with other pressing needs, remember that every single improvement counts. And remember to carry bottled water! Project Seahorse's trade research in West Africa is generously supported by the People's Trust for Endangered Species and the Mohammed bin Zayed Species Conservation Fund. Dr. Tse-Lynn Loh is a postdoctoral research associate based at John G. Shedd Aquarium, Chicago. Her work is part of a joint Shedd-Project Seahorse partnership. This blog originally appeared on National Geographic Newswatch. Wearing a homemade mask, a boy searches for gastropod eggs. A fisher shows off his catch. Many fishers wear masks and gloves to protect against jellyfish stings. A boy and his family's catch. Outrigger fishing boats and marine protected area guardhouse in the distance. Expedition: Danajon Bank has wrapped up, but we’ll continue to post stories and photos in this space as we prepare for the launch of our international photo exhibition later this summer. More news coming soon!